For the second time in three weeks, black smoke was seen emitting from a Houston-area chemical plant. 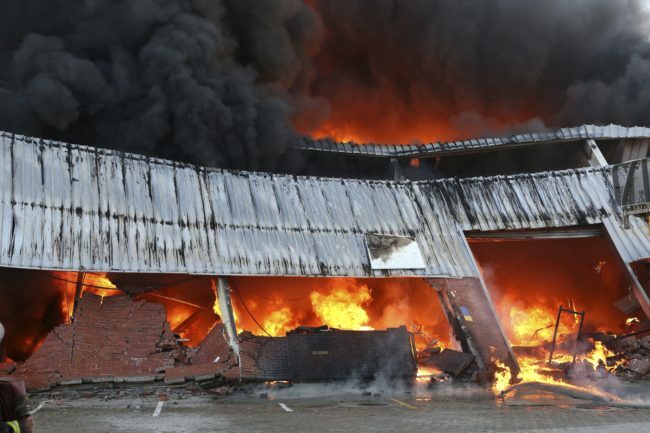 This time, the fire was at the KMCO plant in Crosby, Texas. The explosion at the KMCO chemical plant happened when a transfer line ignited a tank full of isobutylene. Isobutylene is a highly flammable colorless gas. The fire also spread to a nearby storage building containing solid goods. KMCO is a chemical manufacturing and toll processing company. KMCO’s Crosby facility has batch and continuous distillation and multiple reaction capabilities, producing over 900 million pounds per year of toll manufacturing products. Those chemicals are used to make glycol products, antifreeze products, brake fluid products, oilfield products and cement grinding products. The fire was extinguished after a five-and-a-half hour effort by firefighters. One person died at the scene and two people were taken to area hospitals by Life Flight. A shelter-in-place order for those within a mile of the fire was lifted shortly after the fire was extinguished. It had included a mandate that people close windows and turn off air-conditioning units. Initial U.S. Environmental Protection Agency (EPA) tests indicate that the air around the facility is now safe. Investigators are conducting additional testing to determine the potential long-term effects. The KMCO incident follows a fire at an Intercontinental Terminals Company plant in Deer Park on March 17. That fire did not injure anyone, but it did burn for several days and prompted air quality warnings. Given the close temporal proximity, local interests have started pressuring the state regulators at the Texas Commission on Environmental Quality for additional action to increase oversight over chemical facilities. These recent fires may be an impetus in creating yet another conflict between state and federal regulators as non-governmental organizations and activists push for additional and harsher actions by state environmental regulators.